Excellent article–saved me replacing the wrong batteries–the ones in the main UPS were okay–it was the external pack that was bad. I didn’t figure that out until I’d already bought batteries (not a problem–same type). RE getting off the front and back covers: I found it easiest to pry from the bottom (there’s a notch that I got a flat screwdriver into with a little forcing and then just pried outward on the cover). With the bottom end off, you can slide the cover up toward the top and, if you’re lucky, just unhook the teeth of the top tab–or pry a little bit while pushing up (so the teeth on the tab mostly disengage. Before I put it back together, I sanded off the back of the teeth on the snap-together-tabs at the top and bottom of the front and back covers. The effect of that was to make the flat back of the teeth effectively shorter: the teeth angle toward the point on their backs now too (it’s not flat for the whole height of the teeth now). Which minor adjustment, I hope, will make it easier to pry off another time. I also noted that there are molded-in screw holes in the inside case (at least on my model): top and bottom; front and back–if you measured carefully, you could drill holes in the outside front and back cover and use a narrow self-tapping screw to hold the front and back on–and just cut off the frustrating locking tabs–or really grind down the back of the teeth so they’d just hold it in place so it’s easier to get the screws in. It wouldn’t be quite as smooth on the outside, with the screws there, but it looks like a moderately straightforward option to improve access to the guts. If I were going to do that, I’d want to use some washers under the screw heads because the cover does not have a molded-in hole to accept the screw and the face of the cover isn’t very thick. One item that may be of interest to others, when I went to Batteries Plus, the guy basically said, if the battery is the same physical size, it’s almost certainly the right one; they had them in stock. The replacement batteries are widely available on line also (a lot less if ordered although I did not calculate shipping). If you search for BX1500 replacements, you’ll find the right size (generally sold on-line in pairs–with the intention of reusing the harness that is holds the main unit’s batteries together). The same batteries apparently work in either the main unit or the external pack. The Batteries Plus fellow also told me that a good, fully charged, battery will show a voltage of at least 10 volts (they had a tester that would check the capacity, but the ones I took in were so dead they didn’t even register). So, if you take a DC volt-meter and put the positive end into the middle prong on the big plug (whose guts are illustrated in the later pictures), you can put the negative side in the prong on the left (or right–at least one side works), and check either the battery pair in the main UPS or the 4 in the external pack–you should get a reading of somewhat more than 20 volts (my best ones–which are still some years old, mind you) show around 25 volts. (I’ve got 4 of these units with matching external packs.) The ones I’ll work on next show around 20 to 21 volts–probably at least one of the batteries in those packs is no good or perhaps, as in the one I operated on today, a pair is no good. 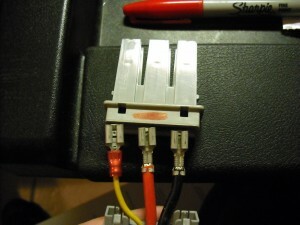 With some extension wires/test leads, a place like Batteries Plus would be able to test the capacity of the dual battery pair in the main unit or the external pack itself to give you even more info–without actually taking anything apart (other than pulling the battery pack from the main unit–a simple no-tools job). That would at least let know what kind of life the batteries have (if the straight voltage test isn’t a it’s-definitely-dead reading). Based on what I know from testing batteries of other technologies (such a ni-cd or li-ion), a battery can still show a reasonable voltage, but not hold much charge. However, if it doesn’t give you the voltage at all, you’ve got a dead one. 12V 7 Ah batteries are available at HobbyTown USA stores for 19.99. They are used to start model airplane engines. Thank you for your comments. I really appreciate the additional info and I’m sure that this will help others in the same situation. One of the reasons I even wrote this article was because of the limited information on the backup expansion pack. There was almost no documentation to start with and all I could find were sites that wanted to sell you a new battery pack at almost the same price as what I paid for the UPS/Battery Pack combo. When I went to the Batteries Plus store, the guy there was really helpful with identifying similar and compatible products and many people I know recommend them for all their specialty battery needs. I’ll keep that in mind about the online ordering however shipping could be a killer. Thanks to all for this very valuable info. I’ll be making use of it in the very near future. Tried to pry off those covers but didn’t want to put any real heavy torx on them until checking the web for info like this! What did we do before the web? Since I’m looking at the inside of the master unit right now I can definitively say that the wires go yellow/red/black starting from the USB connector (or left to right looking at the back of the unit). Thanks for the info. Thank you for the clarification. I’m sure this will help a lot of people. You are very welcome for the information! Honestly, I’m not sure what we did before the web aside from the usual “Well if it doesn’t come off, pry harder! If it broke, well it needed replacing anyways” approaches. I just bought a Back-UPS Pro 1500G and an extra RBC124 battery pack thinking I would be able to plug that in to the external battery connector where the BR24BPG goes. 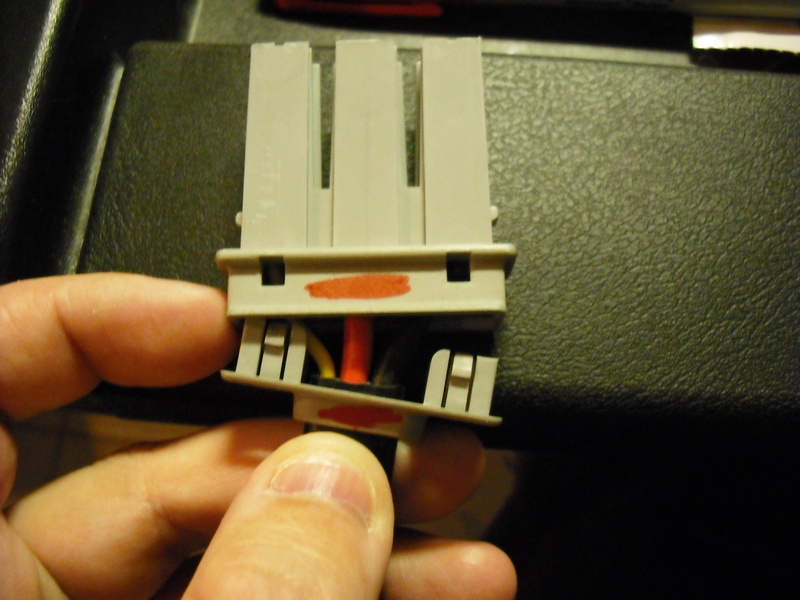 The RBC124 did not come with a connector, but I have one from a RBC32 pack. It includes the yellow wire. Can I plug the RBC124 into the back of the Back-UPS Pro 1500G to get a little extra run time? The RBC124 may contain the right batteries to repopulate a BR24BPG or at least reload the ones that came with your UPS however I don’t think it would work in its existing configuration without further investigation. It really depends on how the battery pack is wired and brief googling didn’t turn up much in the way of wiring diagrams. Be safe and be careful. If something bad happens, it could catastrophically go bad. correction, according to Mrg. these batteries are 9.0Ah not “3.4A” as described above. Nice writeup! I came across your article while searching how to open up the BR24BP, since it eluded me a bit as well seeing no visible entry. The lab I work with was scrapping 3 Back UPS XS 1500 VA, and one of these battery packs. Some of the batteries were pretty bad… the plastic had completely cracked exposing some of the insides! I ended up finding 2 good sets (4 batteries) in between all the 10. Two are questionable, as the UPS says bad battery, but they are not ‘poofy’ nor cracked. I’ll see what a voltmeter tells me with these… they might just need to be recharged, perhaps. I pondered in keeping the battery enclosure, but I needed something to store the bad batteries in so I don’t get stuck with them and my lab can recycle them as asset dispositions, ha. Free shipping, and 4% cash back from Mr. Rebates. Just a note to thank you for putting this resource out here. I have 3 of these and 2 were complaining about the batteries. 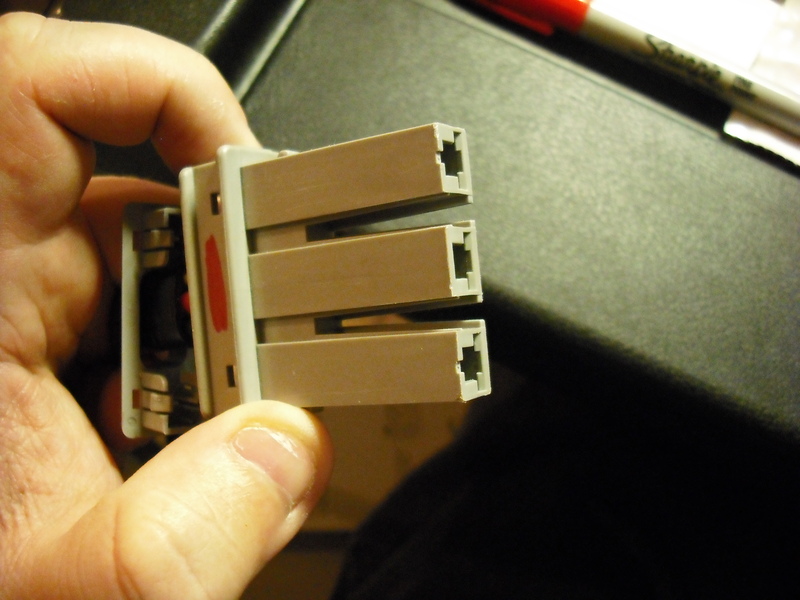 One thing I found… some of the battery packs were deformed and bulging. Not good. I will replace with the same. Hopefully no problems for a while after that. Thanks again for your blog on this. Thanks so much for figuring this out and writing it up! I have a couple of old BR24BP units that I was just about to give up on and recycle, and now it looks as though I can fix them. One of the units contains 4 Vision CP 1290 batteries instead of the HR 1234W units, the difference seeming to be that the CP 1290’s are 9 A hr rather than 7.5. The physical dimensions are essentially the same. Also, the main unit that the BR24BP plugs into, the Back-UPS XS 1500, uses a “RBC 33” battery cartridge. Turns out the RBC33 is just two of the CP 1290s with a plastic spacer containing some cables, so you don’t need to buy a whole new RBC 33, either. Btw, the CP 1290s in the RBC 33 are also hooked in series. Big Mahalo! You da big Kahuna! Help me a lot! I’m glad that you were able to find this information useful. Thank you for the information regarding the RBC33 packs. Mine appeared to be wired up in series which baffles me even further as to the wiring schema of the BR24BP. It’s like a parallel of two RBC33’s for a 24 volt pack. As several other users have pointed out, there are many places to get alternatives to the batteries that APCC sells, and oftentimes you can get a cheaper rate or discount on multiple purchases. That seems to be a common sight among battery failures in UPS devices. It would appear that as the cells age, they have a tendency to build up gases during charging (or in overcharging in a lot of cases) that cause the unnatural bulging. While they are “sealed” batteries, they have emergency vents that will pop to allow for gases to escape. Much better than an exploding battery. It’s recommended to replace any battery that’s showing a bulge as this is usually a sign that the battery has gone bad and will actually shorten your battery backup time. Thanks for the heads up. This is a bit cheaper than what the Batteries Plus was offering them for. You might want to get an external battery charger for those and try to charge them. At the very least, they won’t accept a charge but you may be able to get two more good batteries out of them. SLA batteries are thankfully a bit more forgiving of abuse than other battery types. after maybe One year, my custom battery pack run always good. (connector external on BR1500 APC with only 2 “car battery” 12v in serial (and in a made box). Thank you for your response! It’s always nice to hear this working for people and being able to avoid tossing away a perfectly good battery backup. Simple answer to complicated question: you really want to use only the CSB HRL1234W battery in UPS applications for the 8-9AH class batteries. It is the almost the only battery on the market designed and specified for high rate UPS service with long float life. Otherwise performance and float life will suffer markedly. If you are interested, a tome follows. Lead acid batteries have a particular characteristic due to their construction and chemistry which is that the faster they are discharged, the less total energy they can deliver. This is true of most types of batteries but more so for lead acid than for Ni-cd, Ni-mH, and most lithium chemistries. This presents itself as a substantial loss of capacity (amo-hours or AH) as you increase the rate of discharge. Lead acid battery construction varies based on the kind of service for which they are designed, and between manufacturers. Starter batteries need to provide huge currents but are rarely discharged more than 20%, so they have lots of thin plates which present a lot of surface area to the electrolyte but which are fragile and don’t last long under deep discharge or float conditions. That’s why your car battery lasts maybe 3 years. Deep discharge batteries have robust plates but less surface area, so their internal resistance is higher and so they can’t provide as much peak current. But they can stand hundreds of cycles of 100% discharge. Some, like the ones designed for solar power storage or telephone system backup, can last for 20 years or more. So the mfg. has to get the secret sauce just right for the specific application. Most lead acid batteries (other than starter batteries) are specified at and designed for a 20 hour discharge rate. That is, the capacity a 9AH battery is specified at a discharge rate of .45 amp for 20 hours. Discharge it at a faster rate and you get less capacity; discharge it in a few minutes like UPS does and you get a LOT less capacity, maybe a third or less. Problem is, a UPS really wants both capabilities: a battery that can be discharged in minutes with minimum loss of capacity, but which can handle hundreds of 100% depth of discharge cycles and also be left floating for years. This is where the CSB HRL series comes in. The HRL 1234W design is optimized and rated specifically for UPS-type service. The float life is almost double of the typical 1290 SLA battery – for instance, a PowerSonic P1290 is rated 4-5 years of float life while the CSB HRL1234W is rated 8 years. In both cases this is at 20 deg. C and 2.275V/cell, both of which are critical to float life. In the real world, at 30-35C inside your UPS, its more like 2 years vs. 4 years. But double is still double. The 1234Ws are not rated at 9AH as D Scott mentioned earlier. Rather, the “1234W” refers to battery capacity in UPS-type applications, specified as 34 watts per cell for 15 minutes at constant power discharge, or about 350 watts of output for 15 minutes in a 2 battery inverter once you consider inverter efficiency. This does equate out to something like a 9AH at the 20 Hour rating that is used for most other batteries in the 1290 class. But moat of those batteries will not meet the 15 minute rating as they are not optimized for this service and lose more capacity under high load. And they will only last half as long. The HRLs are premium batteries and they come at a premium price; about 40% more than typical 1290 batteries. But, as with everything else, you get what you pay for. You can buy them in assembled packs from APC (yes, APC uses only CSB HRLs) or on the open market as individual batteries at a much lower cost. Either way, these are really the batteries you should use for max hold up time and battery life. Disclaimer: I have been involved with electronic power design for 20+ years but I have no financial or other relationship with any of the companies mentioned above. Thank you for this write-up as I just acquired an APC 1500-RS that has some issue and want to put more batteries in to revive and test. And if I was successful I wanted to add additional batteries which I can now see how it is done electrically. I came across your article while searching how to open up the BR24BP. Thanks to all for this very valuable info. Better check your resistor value again. It sure looks like a 20 K-ohm resistor, not 20 ohm. I checked several resistor-code web sites to be sure. Those CSB HR 1234W batteries do not have 3.4 Ah capacity, they have 7.2 Ah and they are the most popular UPS batteries in the world, any battery vendor can tell you this. The batteries in the APC pack pictures are HR 1234W, not HRL 1234W so it seems that APC has lowered its standards. The resistor code shows a 20 k ohm resistor, not a 20 ohm resistor. The confusion is because 1% resistors have one extra digit to indicate the more-exact 1% value. Please, PLEASE, correct this mistake. Thanks for the info on cracking open the case. I had 6 new CSB HR1234W’s in hand and was scratching my head as to how they wanted this silly side-car opened. The force required was well past what I thought would break things. I guess I’m not used to 1″ wide snaps made out of thick plastic like this. Does somebody have any part number for the battery power connector so I can make my own extended battery pack without having to break into the BR1500? And if somebody can also tell me an online site where to buy the connectro, that would be just great. By the way, many thanks for your post!! I too checked and it seems the resistor is 20K Ohms not 20 Ohms. I am trying to build this battery pack using this information on this page for my UPS as the BR24 is no longer available being obsolete. I am curious to know the role of this resistor. I searched all over but could not get a clue. Could somebody with a good understanding of electronics give a clue? There is one more explanation for the resistor: It could be a Negative temperature coefficient (NTC) thermistor. The resistance will decrease with increase in temperature. Thus it may serve as a sensor for high temperature. Only the placement and appearance of the resistor does not suggest so! I got this idea from http://www.beis.de/Elektronik/NB2LH/NB2LH-Clone.html where such a resistor is infact being used with an identical circuit diagram. Comments are invted on my earlier posts. One bit of information I was looking for after reading your post was where to put the hole that would allow easy removal of the covers. After extrapolating dada from your photos I came up with a ¼” (6.35mm) hole with a center point 7/8” (22.23mm) from the ends (top/bottom) of the case. It worked well. You can buy white nylon plugs if you wish to plug the holes for aesthetics, not mechanical reasons to plug them. For your interested readers a quick lesson on resistor color code. Preface: this was how I was taught so no haters please. Bad Boys Raped Our Young Girls But Violet Gives Willing. Resistors have 3, 4, 5 or 6 bands. For the purpose of this discussion we will only deal with 4 and 5 bands. 3 bands are 20% resistors and 6 bands are for temperature coefficient, nether of which most of us would be dealing with. The last band is the tolerance. Next to the last band is the multiplier. The rest of the bands are numbers. First, the best way to remember the multiplier is just add the number of (0) as represented by the color. That will give us 2, 0, 0, + 00 (or x100) ohms at 1% or 20,000 represented as 20KΩ (ohms). Other tolerances: Silver = 10%, Gold = 5%, Red = 2%. It’s there to sense something but what could it sense? There are obvious answers like battery voltage or battery current. A voltage sense that eliminates the voltage drop across connectors and long cables would require two wires. A current sense as someone else pointed out cannot cross connectors that would add too much variability. A very usefull sense for an external battery back would be the pack temperature. But that isn’t a thermistor under the shrink wrap. What’s left to be sensed? The resistor value, the connection to the red or black wire and possibly the state of the fuse. What this tells the UPS is which battery pack has been plugged into the connector. The UPS may use this information to adjust the charging current. Or, it may use the information to panic and void the warrantee if the user plugged in the wrong battery pack trying to extend the runtime beyond the designed specification. I was pretty surprised with how much force I had to put into the pack to get it open as well and in the process of gaining access, I ended up breaking a screwdriver. The upside is that at least it’s not the brittle mess that people usually make for enclosures so it’ll take some abuse. Glad to know you were able to get in yours. Doesn’t seem to matter too much what size resistor you use. I tried 20, 22k, and 44k and got the same results from all of them. Seems to just to tell the unit that there is an external battery box. It does however turn on the fan. I guess the fan needs to run whenever there is an external battery. Tied 2 9ah batteries, 2 18ah batteries and, 4 18ah batteries and got the same estimated run time no matter what combination of batteries or resistors I used. I was able to measure the resistor. It has factful 20 kOhm! So, please correct this in you description! Your comment “It would be almost trivial to modify the case” was exactly how I started out. I drilled 2 1/4″ holes (side-by-side) for where I perceived the snaps to be and then used a flattip screwdriver to pry the faceplates off. The holes are about 3/4 of an inch fron the edge. This made taking the covers off simple and like you stated available if we ever need to do this again. Considering I have 6 of these to work on this is a big time saver. Thanks for the other information as well. Thanks for the write up!! Almost four years ago and still a valuable tool! You are very welcome. This article remains one of the most popular articles and it’s always nice to hear that people are still finding it useful. You will need an average flat-blade screwdriver, small will not work. Lay the unit on your lap, front facing away from you. Push on the front cover, near one end, just enough so that you can get the blade of the screwdriver against the inner edge of the cover. Then just hit the screwdriver on the back of the handle with your palm. 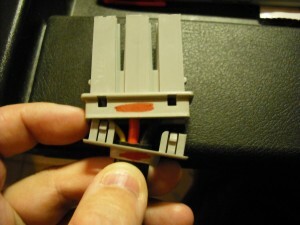 It pops the tab out easily on that end of the cover, and popping out the tab for the other end is easy. For the back cover, repeat the process. I replaced the batteries in the APC RS1500 and the “replace battery” indicator light turned off. How does one know when to replace the batteries in the battery pack BR24BP? Thanks! Old one but great information!